Hungarian Ambassador to Korea Mozes Csoma on Friday brought back to life a forgotten page of history connecting Hungary and a prewar Korean Peninsula. At the Arko Arts Theater in Seoul, he presented an archival photo he discovered to Kim Baek-bong, a 92-year-old woman who took part in the Second World Festival of Youth and Students in Budapest in 1949 as a dancer from a North Korean dancing troupe. Kim was born in Pyongyang in 1927. She was a pupil of traditional Korean dancer Choi Seung-hee, a towering figure in her field. Kim and her husband left North Korea in 1946 and later settled in Seoul amid the 1950-53 Korean War, later becoming a pioneer of Korean traditional dance and professor at Kyung Hee University in Seoul. Csoma, who formerly served as a professor of Korean studies at the University of Budapest, first met Kim in 2016, and the elderly artist told the envoy about her visit to Budapest in 1949. 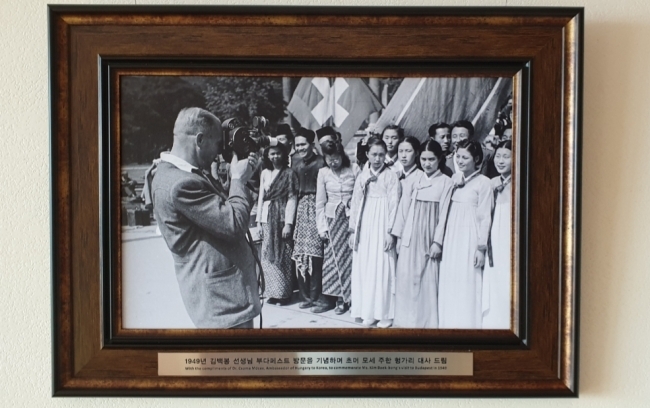 That triggered ambassador to scour Hungary’s photo archive Fortepan, where he eventually found the photo of Kim that dates back nearly 70 years. The recent event was part of ongoing celebrations marking the 30th anniversary of bilateral relations between Budapest and Seoul next year, according to the Hungarian Embassy in Seoul.